Dr. Chafin grew up in McDonough, Georgia. He attended Emory University where he graduated with a bachelor’s degree in biology and was a varsity baseball letterman. He also worked at The Centers for Disease Control and Prevention as an undergraduate. He then graduated from the Medical College of Georgia with his medical degree. His internal medicine training was completed at USC-Palmetto Health Richland in Columbia, South Carolina, where he was chief resident, and his fellowship training in rheumatology was completed at the Medical University of South Carolina in Charleston. Most recently, he was in private practice in Mt. Pleasant, South Carolina. He is married with 3 children. 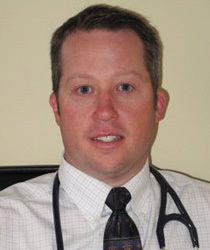 Dr. Chafin is certified by the American Board of Internal Medicine in both internal medicine and rheumatology. He is a member of the American College of Rheumatology. His clinical interests include gout, rheumatoid arthritis, osteoporosis, spondylarthropathies (psoriatic arthritis, ankylosing spondylitis, reactive arthritis, enteropathic arthritis), vasculitis, lupus, myositis and scleroderma.